There are only a handful of really outstanding waterfalls in the Cheviot Hills although there are many which, whilst slightly challenged in the height and volume departments, can be well worth visiting especially when the rivers and burns are in spate. One of the contenders for the title of the best waterfall in Northumberland is Davidson`s Linn which lies in a remote location in Upper Coquetdale just over three crow-flown miles (5km) from the nearest public road. Now surrounded by the suffocating green mass of the Uswayford Forest, Davidson`s Linn is one of the jewels in the Cheviot crown and the main focus of this fascinating walk. 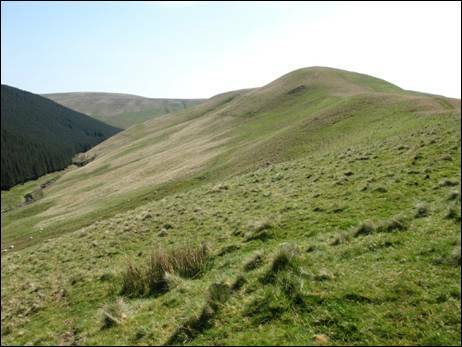 Disregarding all logical and, therefore, potentially more popular routes, your day starts in the shadow of Shillhope Law close to the banks of the River Coquet from where you will make your way to the valley of the Usway Burn via little-visited Shillhope Cleugh. A steady but solid climb then takes you onto the firm track of Clennell Street from where you will head towards the isolated farmstead of Uswayford and the neighbouring Clay Burn. Soon you will reach Davidson`s Linn where the trees open up and reveal the most idyllic spot to pause for lunch. In time, you will begin your return journey by following Clennell Street for a short period of time before heading to the lesser heights of The Middle, Middle Hill and Kyloe Shin. After a superb grass-carpeted interlude of easy walking you will then tackle the rather more substantial Shillhope Law. A slightly out-of-the-ordinary descent will eventually deliver you back to the beautiful River Coquet and the end of a fairly testing day out in the hills. You will simply love it! 1.”Beyond Alwinton the river winds in a deep, grassy gorge which the rough road crosses from side to side by quaint little bridges and fords, occasionally seeking the hillside far above the cascades and foam-flecked pools of the tumbling stream”. So wrote Robert Hugill in his 1931 book, `Road Guide to Northumberland and the Border`, who then went on to explain, “There is a road as far as Barrowburn, but it is not yet suitable for motoring”. Luckily for the 21st traveller intent on penetrating the upper reaches of Coquetdale there is now a reasonably well-surfaced, single track road through the valley which crosses a series of sturdy bridges, three of which you will pass over as you make your way from Alwinton to the starting point of this walk. After crossing the third bridge, close to a weir on the River Coquet and prior to reaching the climb past Bygate Hall Cottages, find a space to park on the flat grassed area (GR NT868084) which forms part of the south bank of the river. This is on the right hand side of the road. On the opposite side of the river, the steep slopes of Inner Hill climb relentlessly upwards whilst, to your left, lies the out-of-bounds terrain of the extensive Otterburn Training Area. Once you have taken in your immediate surroundings and you are ready to roll, make your way back along the valley road as far as the 1935-constructed, concrete and beam bridge you have just recently negotiated. Once on the other side turn immediately left, noting the two cutwaters beneath the bridge, and follow the clear green track which now contours the hillside and runs parallel with the river. 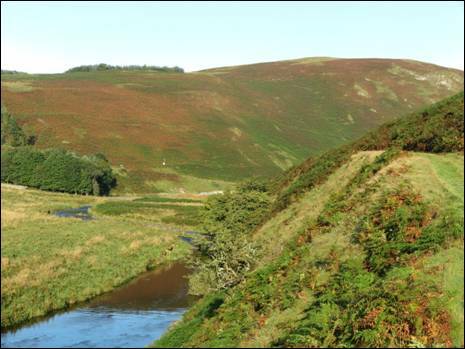 Ahead, on the opposite side of the River Coquet lies Dumbhope Law, 386 metres (1266 feet) high and as pretty as a picture. You are following the old road through the valley, which was described by David Dippie Dixon in his 1903 book, `Upper Coquetdale Northumberland Its History, Traditions, Folk-lore and Scenery` as, “ascending the southern shoulder of Shillhope Law, along by Shillhope Cleugh, at a dizzy height above the bed of the stream” and, bearing at this point the name of, “Shillhope Racks”. He was, of course, describing this road viewed from a point further upstream close to the old Bygate Hall ford, which is still occasionally used by farm vehicles. 2. Soon you will reach a neat circular stone sheep stell and an adjacent small building and, if you glance across the river, you will spot a matching circular stell on the opposite side. Just ahead of where you are standing a tiny trickle of water slips downhill and it is now time to turn to your right and to knuckle down to some hard work. 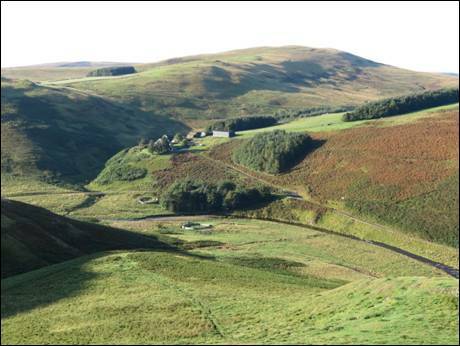 You are standing beside magnificent Shillhope Cleugh (GR NT865085) which slices between Inner Hill to the right and the south western spur of Shillhope Law to the left. Now you must head more or less straight up the middle of the cleugh keeping close to the post and wire fence lying slightly to the right of the thread-thin watercourse. So, “stiffen the sinews, summon up the blood” and without further ado follow the post and wire fence uphill, initially on the left hand side but fairly soon stepping over to the right hand side where you might just be able to pick up a faint intermittent trace. Whether this is man-made or worn by generations of passing sheep, it is difficult to know. However, you are unlikely to meet another soul on this part of the walk. The going can be rough in places but a steady determination will soon have you cresting the rise you have seen ahead of you since you started your climb. On reaching level ground you will meet up with the fence which cuts across this saddle between Inner Hill and Shillhope Law together with a gate. Clamber over the gate and turn immediately left and after approximately 40 metres you will see a quad track on your right. This is your route to the next valley, that of the Usway Burn. 3. Follow the quad track as far as it goes and then, when it finally gives up the ghost, set your sights on the lower end of the watercourse which lies to your left. 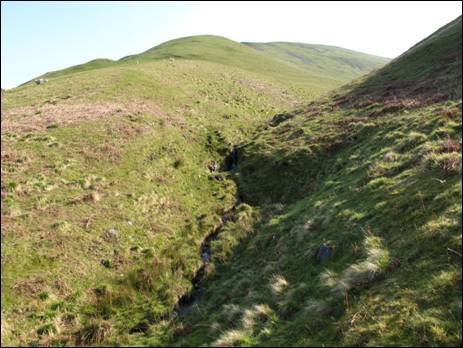 A swift look at your map will reveal that this watercourse runs through Lee Cleugh and eventually slips into the Usway Burn exactly at the point where you need to be (GR NT883097). As you wander downhill surrounded by some of the most beautiful views you are likely to find in the area you might spot a single mountain ash tree clinging to the side of Lee Cleugh. If you have the desire and the excess energy a short and careful detour will reward you with a splendid little waterfall half-hidden behind the tree. Once you have reached the banks of the Usway Burn you must turn right and follow what little there is of a burn-hugging path downstream as far as the bailey bridge some 400 metres away. Cross over the bridge and, turning to your left, keep with the track as it heads towards the farmstead of Batailshiel Haugh. This small cottage, which replaced the 2003-demolished two storey farmhouse, is known locally as Battleshield. Once the farm`s five bar gate is reached you must leave the track behind and follow the public footpath which climbs to the right of the farm enclosure. Eventually, a short time after crossing the stream which runs through Mid Hope, the path splits in two with the left hand spur, marked on the map as a bridleway, dropping back down to the valley floor. 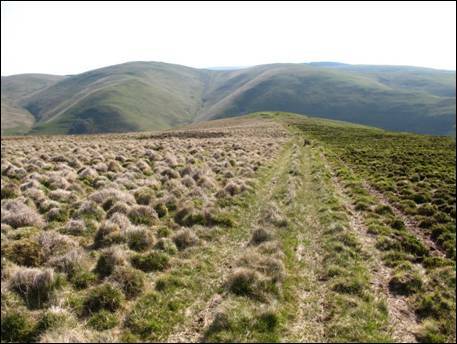 Your route follows the right hand spur, marked on the map as a public footpath, which begins a long and mainly steady climb to Clennell Street firstly by fording Barley Sike and then negotiating a small fenced sheep enclosure. On reaching the small saddle between the grass-carpeted mounds, on your left, and the steep, higher ground, on your right, you might wish to make a short detour over the five bar gate to enjoy the near-vertical views of the Usway Burn from the twin tops of The Castles. Back on course, stay with the winding uphill green track which presses on over initially firm ground but eventually, once the gradient eases, across potentially boot-splashing terrain. In time, and with a little patience, the track of Clennell Street will be spotted ahead of you lying beyond a post and wire fence, a gate and a stile (GR NT894109). Once across the stile, and having safely made it to the other side of a forestry drainage ditch, turn to your left and then start making some rapid progress along the well-graded track. 4. To your right are the remnants of the now harvested first generation conifers of the vast Kidland Forest and, for the time being at least, there are some views eastwards which have not be seen for a number of years. Make the most of these views as second generation saplings have already been planted in many parts and as the years tick away the views will, inevitably, once again become obscured. After a little less than 800 metres of easy walking the track divides into two separate strands. The left hand one is Clennell Street which continues its journey towards the border at Hexpethgate whilst the right hand strand wanders into the north-western corner of the Kidland Forest. This is your route although after 400 metres be sure to follow the left hand track and not the right hand one as this will only lead you deeper into the forest. The forest track is relatively straight with the deep valley of the West Burn below you on your right and as you stroll along you will ever so gently gain a little height. After a while, the track begins to make a reasonably sharp turn to the right as it loops around the head of the valley and here you will see a narrow gap in the trees on your left hand side along with a marker post (GR NT888131). This is your exit out of the trees where a tricky-to-follow path will lead you through the waist high undergrowth to a stile. This is the watershed of the West Burn so expect the ground to be anything but dry. Once across the stile turn right and keep with the narrow, mainly obvious fence-hugging path as it squelches its way north-eastwards. This path eventually pulls away from the forest boundary across rough, heather-covered ground to reach the fence which runs across the saddle between Yarnspath Law and Bloodybush Edge. Make your way to the gate in the fence and clamber over. 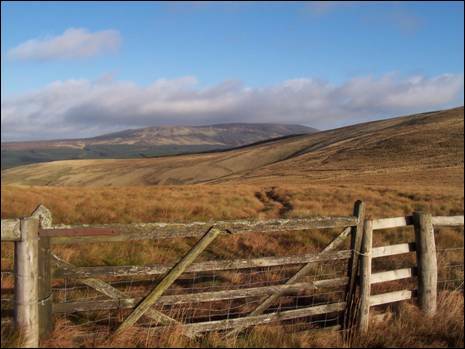 Since joining Clennell Street you have been travelling along part of the route of the Alwinton Fell Race which climbs a total of 884 metres (2900 feet) on its 14 mile (22.5 km) undulating journey over two of the highest tops in the Cheviot Hills, Bloodybush Edge and Cushat Law. You are now about to leave that route behind. 5. Now head straight on following the indentations of a quad track across wet and, in some places, potentially slippery ground. Take care as you make your way downhill keeping as best you can to the intermittent tracks and paths which are ultimately caught between the deep set Bill`s Sike on the left and a fence on the right. Eventually you will pass through an old stone-walled enclosure as you head towards the point where Bill`s Sike is joined by Scoop Sike arriving from your right. After splashing your boots through the narrow watercourse you will find yourself walking across sheep-cropped grass towards the first of two stiles in quick succession as you head around the boundary of Uswayford Farm (GR NT887145). In his superb 1950-published booklet, `A Guide to the Cheviot Hills`, F. R. Banks described Uswayford as being, “attractively situated on an outcrop of rock where a tributary joins the main burn”, adding that the Usway Burn is, “well worth exploring above the farm”. Indeed it is and that is exactly what you are about to do. So, after negotiating the second stile keep heading straight on, crossing another small stile en route to the not-too-distant Clay Burn. You should by now have picked up a thin, hillside-clinging path with the lovely Usway Burn downhill to your left. Very soon you will reach the confluence of the Clay and Usway Burns neatly situated beneath rock-invaded, grass covered hillsides which are topped with the conifers of the Uswayford Forest. 6. This is an absolutely delightful and peaceful setting and one where you could well lay your blanket on the ground and linger for sometime. However, with the prospect of Davidson`s Linn little more than 15 minutes stroll from here not to mention the many more miles still to walk before you can call it a day it is time to keep moving on. So, pick your way across the Clay Burn, close to the point where it meets with the Usway Burn, and start climbing the fine green track which slips between two rocky outcrops straight in front of you. When the forest boundary fence is reached do not continue to follow the track along the outside edge of the trees. Instead, cross the stile over the fence and make your way into the mass of conifers via a very convenient forest ride. This is relatively narrow in places, sometimes with views outwards, but by keeping to the ride you will soon reach a junction where a helpful signpost will (hopefully) still be in situ. Your onward route heads to the left, indicated on the signpost as, `Salter`s Road West`. You are now totally surrounded by the dark green blanket of the Uswayford Forest as you try to avoid getting your boots too wet on what can be a pretty messy track. Do not fear it does improve fairly rapidly when you meet up with a relatively new graded and rather unattractive forestry track. Follow this to your left as it slips downhill to a small wooden footbridge across the Usway Burn (GR NT884157). 7. Once you have crossed the burn your ultimate route starts close to the nearby circular sheep stell in the form of a graded, uphill track. But first you must make a too-good-to-miss visit to see Davidson`s Linn in all its glory. So wander downstream to the top of the falls where you will spot a small path edging its way down the right hand side of the rock and grass surrounds which, with a little bit sure-footedness on your part, will deliver you to the base of these fine falls. 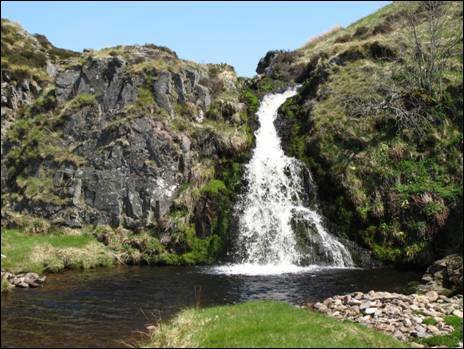 This waterfall was described by David Dippie Dixon in his 1903 book, `Upper Coquetdale Northumberland Its History, Traditions, Folk-lore and Scenery`, as, “a fine waterfall of considerable height………where the flowering willow grows in great luxuriance”. It is without doubt one of the most tranquil places imaginable where the waterfall can, especially after rain, become a bubbling, snow-white tumble of water fringed with a patchwork of grass, rock and moss which, in late spring, is sprinkled with a multitude of wild primroses. To add to the beguiling nature of the place there is also a very tempting peat-brown pool at the feet of the waterfall. Tarry awhile for it must now be time for lunch. Suitably fed and watered, retrace your steps to the circular sheep stell and, turning left, follow the track uphill once again entering the trees. When a cross forest track is reached, turn left and then after approximately 50 metres turn right onto a gently rising gravel path. At the top of the rise and out of the forest, cross over the stile and walk straight ahead over slightly damp ground to reach Clennell Street, the king of all Cheviot drove roads (GR NT875156). Here, Salter`s Road, the route you have been following, merges with Clennell Street which, to your right, makes its way to the border at Hexpethgate little more than 500 metres away. 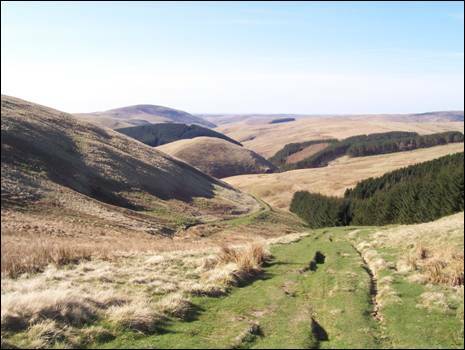 Your route now lies to your left, heading towards Hazely Slack along the south heading route of Clennell Street which will be your stride for stride guide for the next 1.3 miles (2 km). This is easy walking along what is now designated a `restricted byway` at a height never falling below 400 metres (1300 feet) until towards the end of the descent of Hazely Slack. Enjoy it whilst you can as there is still quite a lot of climbing to come. 8. After a stretch of relatively flat terrain the track, rutted in places but still retaining much of its greenness, winds downhill across the western slopes of Hazely Law offering fine views towards the final three hills of your walk, The Middle, Middle Hill and Shillhope Law. At the base of the enjoyable descent you will reach the gravel access track which, to your left, serves Uswayford Farm and to your right heads towards Trows, Rowhope Farm and ultimately the public road through Upper Coquetdale. Here you must cross over the track and head towards the wooden shed beyond which lies a five bar gate with an adjoining stile. Once over the stile your route follows the public bridleway which contours the eastern slopes of The Middle whilst looking down to the attractive Usway Burn below. You can, of course, if you feel `full of running` opt to follow the quad track which climbs over the top of The Middle and which delivers you to exactly the same spot as the bridleway will; the forest edge. Once the forest is reached, climb over the ladder stile next to the five bar gate into the trees (as at May 2017 there has been substantial harvesting of the forest hereabouts so expect a few changes although route finding should not be affected) and start to climb uphill on a clear forestry track until you reach the rather messy junction of two tracks. Turn right along an extremely rutted track and when this bears left keep following it along a green and pleasant ride over the spine of Middle Hill. At the end of the ride, which has offered you tantalizing glimpses of Shillhope Law, turn left onto a firm track and then immediately right to reach yet another five bar gate. Cross over the adjacent ladder stile (GR NT873120). 9. Ahead and a little to your left rise the steep, rounded slopes which will ultimately lead you, after expending a tad more energy, to Kyloe Shin. A clear quad track will guide you much of the way although as you approach the unmarked top, some 433 metres (1421 feet) above sea level, you will need to make a slight detour to your left to reach maximum height. A little bit of guess work will, at this point, be needed to calculate where the actual top lies. Once there and after soaking up the stupendous view, your onward route lies initially in a south-westerly direction aiming for the saddle between Kyloe Shin and the next, slightly knobbly small rise. By the time you reach the base of this rise you will have picked up a clear quad track which will lead you around the right hand side of the rise and then across the superb ridge separating Kyloe Shin from its big brother Shillhope Law. Do not be tempted by any side tracks should you spot them as they will only lead you astray. 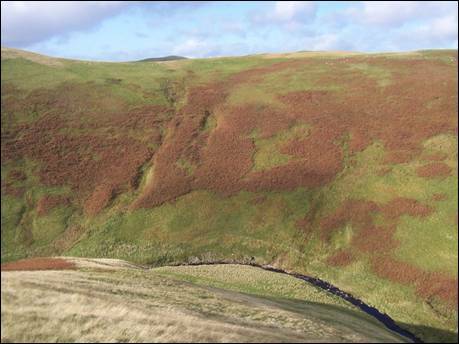 Keep your eyes firmly fixed on Shillhope Law and your final climb. Eventually, and a short while after starting your climb, you will reach a five bar gate and the end of the track you have been following. Climb over the gate and, with the fence on your left hand side, continue upwards on a deteriorating path through rough heather. It is now just a question of keeping your head down and plodding ever upwards, pausing from time to time to gather your breath. Remember to look back over your shoulder. As the gradient begins to level off you will see a thin path cutting diagonally to your right and making its way to the triangulation pillar which, along with a shelter cairn, adorns the summit of this 501 metre (1644 feet) high hill (GR NT873097). This, as you will have guessed, is your route onwards and before you have had time to plan your next walk you will be sitting on one of the many stones which litter this fine top. Once you have gathered up what little energy remains in your tank, it is time to say goodbye to the higher ground of the Cheviot Hills and to begin your slightly unusual descent back to the River Coquet. So, seek out the track which leaves the summit in roughly a southerly direction and then, after approximately 100 metres, veer to the south-west through low heather on the beginning of what is a fairly obvious descending shank. In time, the ground cover becomes cropped grass over which runs an intermittent quad track. Ahead, in the middle distance, you will see the buildings of Bygate Hall Cottages and then, after you have lost a little more height, the circular sheep stell lying at the bottom of the shank along with the adjacent small building you passed on the early part of your walk. Navigation is now pretty straight forward, aim for the stell and the building along the line which suits you best and all too soon you will be back beside the River Coquet (GR NT866085). Now turn left and retrace your steps along the old valley road and when you reach the road bridge across the river head to the other side following the road the short distance back to your car. Wow, that was some walk! Whilst there are many good paths/tracks over mixed terrain there are a number of sections where there are none at all. Quite a number of ascents & descents some of which are long and steep. Some of the route can be very wet. Two very short stretches of tarmac.